The 4-story building was sold after “many months of negotiation,” the longtime owner said. 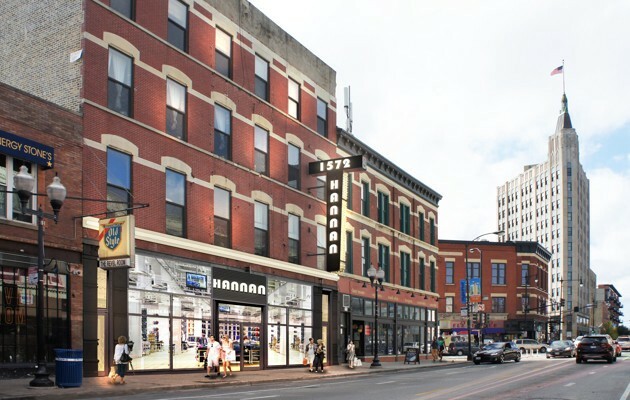 WICKER PARK — The former Double Door building in Wicker Park was sold for $9.1 million on Friday to a Loop-based real estate development firm. Located in the heart of Wicker Park’s main Milwaukee Avenue strip, the 17,000 square-foot, 4-story building was sold after “many months of negotiation,” said longtime owner Brian Strauss. Strauss said he sold the building for $9.1 millon. A spokeswoman for Chicago-based investment firm CA Ventures, which also owns a building next to The 606 at 1755 N. Damen Ave., confirmed CA Ventures bought the building that formerly housed the iconic rock club. Jack Duncan, director of CA Urban Living, issued a statement on Monday. “CA Residential has purchased the property at 1572 N. Milwaukee and will own and operate the building, which consists of 11 apartments and retail on ground floor. The firm is currently evaluating plans for the retail space,” Duncan said. Rendering from a Mid America Real Estate brochure for the former Double Door building. Strauss’ family has owned the building since 1977. There is a door at 1570–72 N. Milwaukee Ave. and another one at 1551–59 N. Damen Ave., giving the former club its Double Door name. For 18 months, Double Door co-owners Sean Mulroney and Joe Shanahan battled Strauss in court over whether they were given enough notice before owners refused to renew their lease. Double Door ultimately lost the battle and was evicted on Feb 6, 2017. The venue has been empty since then, but tenants remain in the apartments above the club. Plans for a Double Door comeback have been hinted at by Ald. Joe Moreno (1st) several times over the past months. “Just confirmed 100%… double door is going on the location at…” Moreno teased in a text message to a Block Club reporter Saturday with no further explanation. He did not respond to multiple requests for clarification or comment. A proposed location in a former bank building in Logan Square never panned out nor did the former Central Furniture site in Wicker Park. Last month at a “State of the Ward” chamber gathering, Moreno assured business owners that the Double Door is coming back to Wicker Park, but he said he could not reveal exactly where just yet. McKay was referring to Strauss’ federal and state court case against Moreno and the City of Chicago for what he says was a violation of his rights. In the fall, the City Council voted to change the zoning on the building that previously housed the famed music club Double Door — despite Strauss’ repeated pleas that the move will make the property less valuable and harder to sell. The action, known as “downzoning,” was initiated by Moreno who was captured on video last May threatening to ensure Strauss would be stuck with an “empty building with no income” after Strauss feuded with the club.